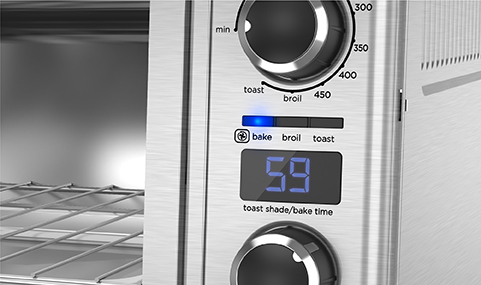 Digital controls take the guesswork out of cook times with this premium countertop oven. Set the timer up to 90 minutes and choose from seven toast shade selections. The digital screen helps achieve precise results every time. 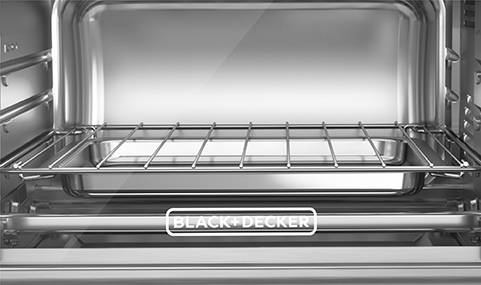 This countertop oven is engineered to cook 20% faster* thanks to improved convection heating technology that ensures fast, even cooking with all four functions: bake, broil, toast, and keep warm. The interior is large enough to fit up to six slices of bread or a 12” pizza, and three rack positions provide the flexibility to cook all types and sizes of food. Plus, the external crumb tray makes it easy to keep the toaster oven and your countertop clean. 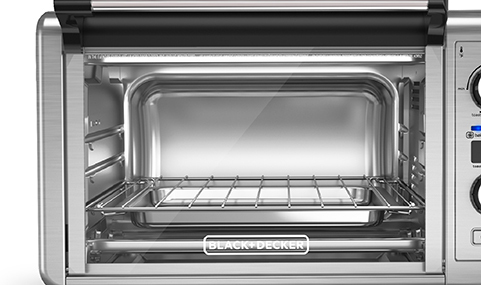 Our latest kitchen innovation shows why BLACK+DECKER™ remains the #1 brand in toaster ovens**. **Source: NPD POS, data as of February 2017 in USA. Improved convection technology increases the speed and evenness of cooking for quick and delicious meals and snacks.